The Merchants Park, on Fir Hill, adjacent to Glasgow Cathedral, was owned by the Merchants House of Glasgow when in 1825, at the suggestion of Rev Dr Robert Stevenson McGill, Professor of Theology at the University of Glasgow, James Ewing (Dean of Guild of The Merchants House 1816, 1817, 1831 and 1832) threw himself into organising the creation of a statue of the Scottish reformer, John Knox to be placed at the uppermost point of what is now Glasgow Necropolis, situated on the second highest hill in Glasgow. 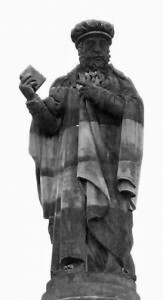 The statue, designed by William Warren was of John Knox wearing his Geneva gown with his right arm half extended and holding a Bible in his right hand. 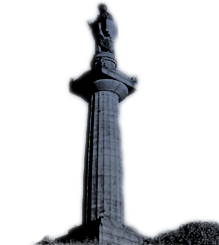 The statue was placed on a 58 ft (17.78m) sandstone Doric column and base designed by an Edinburgh architect, Thomas Hamilton*. The self taught sculptor Robert Forrest** carved the statue in sandstone. Interestingly, and perhaps surprisingly, this was the first statue of John Knox to be erected in Scotland and the building of it created enormous public interest. Knox was not buried below this memorial, but under what is now an Edinburgh car park! On 22nd September 1825, upwards of 300 subscribers met in the Trades Hall and walked in procession, followed by a great number of clergymen of different denominations, to St George’s Church which was already crowded. A service was held with the sermon given by the well known preacher of that time, Rev Dr Chalmers, minister of the Tron Church. The sermon was described by William McGavin (known as “The Protestant”, who has his own memorial in Glasgow Necropolis) as “brilliant, nervous and powerful,- learned in historical research, elegant in style,- and delivered with all the impressiveness of impassioned eloquence”. McGavin then goes on to report “The interest shown in this ceremonial was of no ordinary nature; the streets through which the procession passed were so crowded that it was with difficulty the subscribers could move along. Every window was filled with spectators, and the house-tops were in full requisition. When the procession had reached the Necropolis grounds, and commenced its progress to the summit through the winding walks skirted with young planting, the scene was truly magnificent. In looking down to the churchyard (Glasgow Cathedral), the eye beheld probably ten thousand persons, whose continued shouts of approbation rent the air. To the most uninformed spectator, the sight must have been interesting; but to him who could bring into recollection the many transactions which had taken place in that venerable edifice, previous to the Reformation, and since that ever-memorable period, the scene was grand beyond description”. This report was written by McGavin a few years after the event, hence his use of the word Necropolis rather than Fir Hill or Fir Park. The foundation stone was laid by Dr McGill who then gave an address to the Committee of Management which was followed by an address to the Subscribers by James Ewing to thank them and all the professionals involved in the project. In the evening, there was a celebration dinner held at which James Ewing acted as croupier (master of ceremonies) and made another speech. on the 22nd Day of September 1825. The Reformation produced a revolution in the sentiment of mankind the greatest as well as the most beneficial that has happened since the publication of Christianity. In 1547 and in the city where his Friend George Wishart had suffered, John Knox, surrounded with dangers, first preached the doctrines of the Reformation. In 1557 on the 24th of August, the Parliament of Scotland adopted the Confession of Faith presented by the Reformed Ministers, and declared popery to be no longer the religion of this kingdom. John Knox became then a Minister of Edinburgh, where he continued to his death, the incorruptible guardian of our best interests.